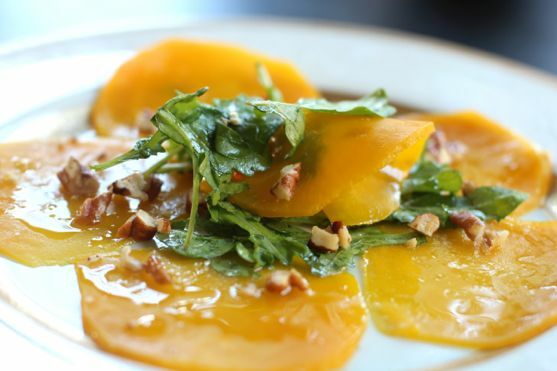 A few weeks ago we went to New Orleans, and one of the restaurants inspired this dish of orange beets. Compere Lapin served us a beautiful beet salad made with pistachios and kale pesto. 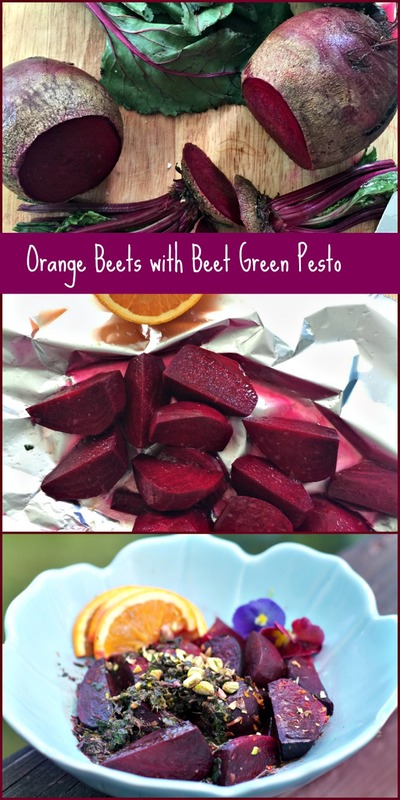 When I purchased the beets to attempt to make this, the beet greens were so fresh I couldn’t discard them. Thus, beet greens pesto. If you can’t find beets with healthy beet greens attached go ahead and use kale or serve with this homemade basil pest0 or this seven herb garden pesto. Beets are no stranger to Spinach Tiger. My number one post every day is a beet smoothie, and this raw beet salad is always in the top 10 percent. There are months that beets go off my radar, but that shouldn’t happen because the health benefits are just too powerful. Beets contain betaine, a substance that relaxes the mind and is used in other forms to treat depression. It also contains tryptophan which is also found in chocolate and contributes to a sense of well being, promotes the health of internal organs and a growing body of evidence shows that betaine is an important nutrient for the prevention of chronic disease. 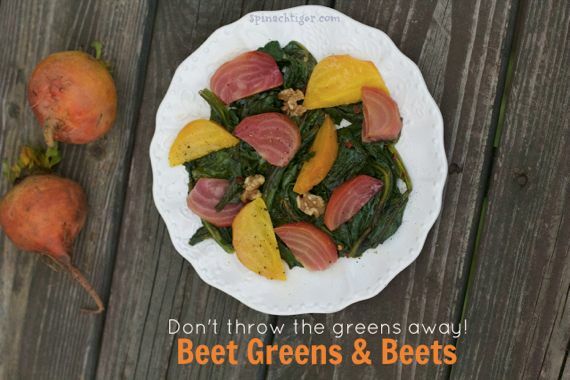 Beet Greens are also extremely healthy, high in iron, Vitamin K, magnesium and much more. I’ve sauteéd beet greens in this recipe but this is the first time I’ve used them raw. I roasted the beets after dousing with a little olive oil and a lot of freshly squeezed orange. The beets greens were mixed with some olive oil, a little basil, garlic, orange and pistachio nuts. I had my doubts that this would work, but when you take a bite of the beet with the beet greens pesto, lemon it comes together well. This is a simple dish, but it has complex flavors and layered textures. You could add in some goat cheese and make this a meal all by itself or serve it with a more subdued fish dish. 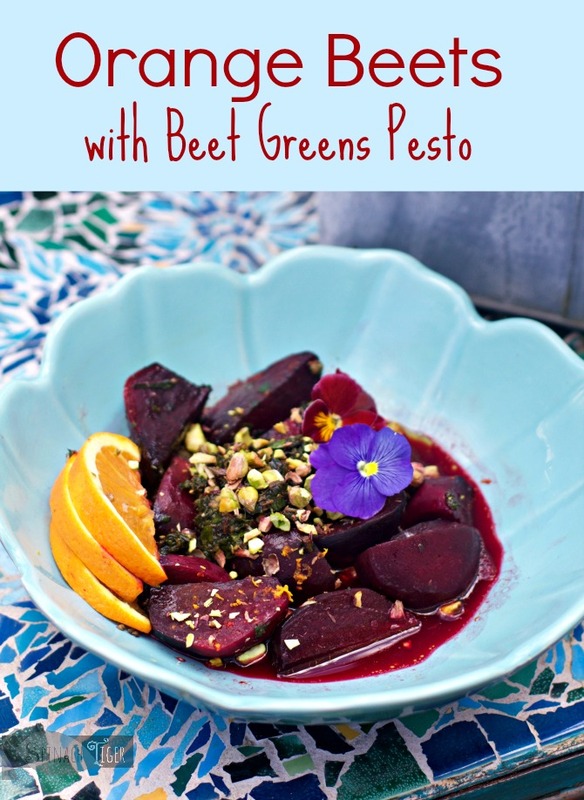 Orange Beets salad with a pesto of beet greens, pistachios and lemon for a wonderful side dish. Trim off beet greens. Wash well. Using a pairing knife or potato peeler, peel skin from beets and cut into quarters or large bite sized pieces. Douse with a tablespoon of olive oil and juice of half of the orange with zest. Wrap in foil and roast in oven at 350 degrees for 35-50 minutes or until tender. Check at 15 minutes and turn. Remove and douse with remaining orange and zest of that orange while still warm. Mix in small food processor or blender, beet greens remains olive oil, lemon juice, garlic and two tablespoons pistachio nuts. Blend until smooth. Taste to season with salt and pepper. Add more olive oil if needed. Bring beets to room temperature. Drizzle with more olive oil if needed. Season with salt and pepper. Top with beets pesto and remaining pistachios. Let’s Connect on Instagram for more food that never makes it here.